IQTell is (was) a productivity system designed to implement the GTD (Getting Things Done) system by David Allen. It was not affiliated with the GTD company, but had a very good handle on what GTD is all about. I have been an avid GTD follower for a number of years. My tool of choice for a long time was OmniFocus, a Mac OS/iOS-only GTD tool. It worked very well for me until I determined a cross-platform solution was what was needed. There are a plethora of GTD tools available, and after searching/reading, I discovered and switched my system to IQTell (note that depending on when you read this, that link may no longer work). It tightly integrated email, calendar, actions, projects, Evernote, and more, across the board. It did so in a fashion far more than any other tool that I could tell. The learning curve was a bit high, but the benefits seemed worth it. As I continued to use IQTell, what began to concern me was how integrated the systems were. For example, as I created actions in my IQTell account, corresponding items in my Evernote account would appear. This was by design and I understood so after a little while. It got me to thinking, “what else is integrated that I am not aware of?” Another example I struggle with is email – IQTell would import email from all my accounts – Gmail, Exhchange, etc. Since it did this, I believe it would have a copy of the emails from those services on the IQTell servers as well, and that was a step beyond my comfort level (probably unfounded, but it did concern me). In the long run, I decided to move away from IQTell for reasons like this. I was a fan of what it was trying to do, enough to pay for the service when they rolled out a pricing structure, but in the end decided to move on. This brings me to the point – I lucked out on this one in that I had already moved on to another service for my GTD System (Evernote, using techniques from The Secret Weapon). But the fact is some technology services we rely on will just stop working one day for reasons beyond our control. They may even stop without warning, right when you try to login to get to your stuff (whatever that stuff is). Is the data stored on the service backed up somewhere so it is accessible? What are the implications if it is not accessible? What is the backup plan? Just like everyone WILL experience a computer crash where all data is lost, we are at a point where everyone WILL experience a end-of-service notice for something they have relied on. 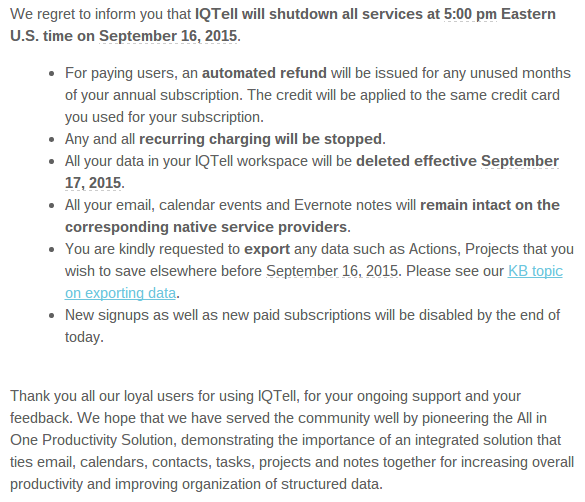 What if Evernote sent out a notice like this? What if Goolge sent out a notice like this for gmail? What service is going to sbut down next? Next Next post: Or, It WON’T Happen Just Yet!